Motorists who refuse to wear their seat belts – beware. 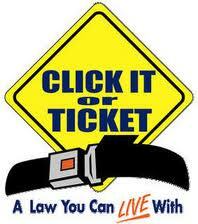 Indiana State Police, Bremen District will be participating Indiana’s 2012 Click It or Ticket seat belt enforcement which beginning this Friday, May 18. This national mobilization will take place over the Memorial Day holiday period and is supported by thousands of law enforcement agencies and traffic safety advocates across the country. In Indiana, more than 250 law enforcement agencies will conduct special patrols – day and night, to identify and ticket unrestrained motorists. The effort will conclude on June 3. According to the U.S. Department of Transportation’s National Highway Traffic Safety Administration, in 2010 nationally, 61 percent of the 10,647 passenger vehicle occupants who were killed in motor vehicle traffic crashes overnight (6 p.m. to 5:59 a.m.) were not wearing their seat belts at the time of the fatal crash, compared to 42 percent during the daytime hours. In Indiana, there were 3,322 crashes involving unrestrained drivers/occupants in 2011 and 202 fatalities involving unrestrained drivers/occupants. These numbers included 445 crashes involving unrestrained drivers/occupants in the Bremen District which includes Marshall, St. Joseph, Elkhart and Kosciusko Counties. As a result of those 445 crashes, 381 people suffered injuries and 36 people were killed. Just last year in Indiana, 1,024 people were ejected from their motor vehicles due to being unrestrained. Nationwide, younger motorists and men are particularly at risk. NHTSA data shows that among teen and young adult passenger vehicle occupants in 2010, ages 18-34 who were killed in motor vehicle traffic crashes, 62 percent were not buckled up at the time of the crash – the highest percentage of any age group. The number jumps to 66 percent when just men in this age group are included. Motorists should be prepared to see more law enforcement on the roads during this 15-day period. Special patrols will take place around the clock, and if law enforcement finds you on the road unbuckled at any time, you can expect to get a ticket. No excuses and no exceptions.